If I had a penny for every time I heard someone say, “Oh, in the summer it is so hard to eat healthy!” … well, I’d probably have a dollar by now! I agree, summertime can present chaotic schedules, delicious BBQ’s, and ice cream (oh, the ice cream!). But now that it’s August and summer is almost over, it is time, my friends, to reset your digestive system! Who’s with me?! Before we know it, the holidays will be here, and I’ll be hearing “Oh, during the holidays it is so hard to eat healthy.” Let’s face it, there will always be an excuse. This is a challenge for everybody, myself included. Any lasting change takes a solid effort. You will fight against it, but if you hold strong and stick with it, you have the potential to completely shift your way of life in a positive, lasting way. Before we get started, let’s get a few things straight, right off the bat. You do not need a crazy diet to eat well. You do not need a fast or a cleanse to get “back on track”, and you do not need to start tomorrow. You can start right now! 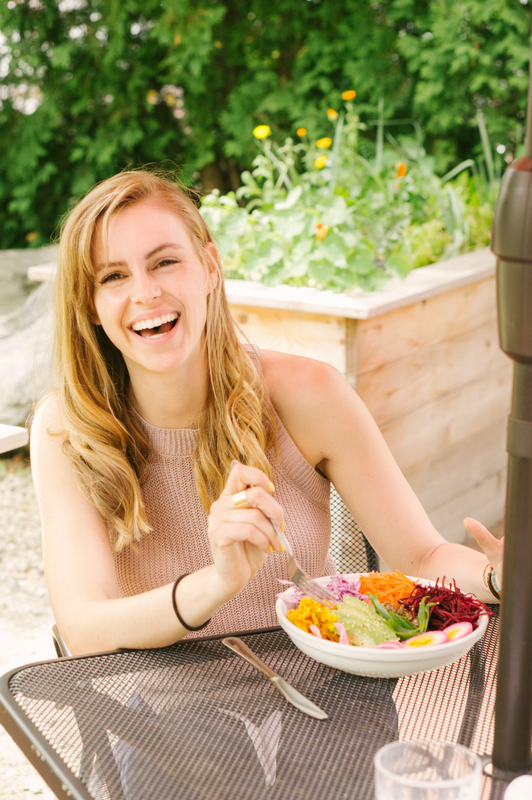 My goal today is to introduce to you 3 easy tips to reset your digestive system and ideally, get you feeling better than ever! That’s right, nothing out of a box or a bag, basically--nothing out of the middle aisles of a grocery store. Let’s try and eat the way the cave people ate, sticking to things we can grow, hunt, fish, or pick! The amount of chemicals, additives, preservatives, GMOs, dyes, and fillers in our packaged food is alarming. Have you ever stopped to pay attention to how your body feels after eating them? Personally, I have almost immediate reactions to most processed foods, including headaches, palpitations, anxiety, and bloating. Not fun! Now, before you go saying that it’s okay because you aren’t feeling these symptoms, stop and think: Do you experience any other symptoms? If you’re not sure, just pay attention to how you feel after eating processed foods. Everyone experiences different symptoms, but an adverse reaction to food in any way, including undesired/unexplained weight loss or gain, constipation, diarrhea, fatigue, muscle aches and pains (yes, this too), or inflammation, should be looked at more closely and addressed. Almost any, if not all, ailments in our bodies can be linked back to the food we eat. If you’ve been with me for a while, this is not the first time you’re hearing this. (A much longer and more descriptive explanation can be found here.) There is a reason I keep bringing this up, and that’s because it is extremely true, and yet relatively unknown in the general world of health and wellness. To summarize in a very basic and easy to understand way, our body needs “fire” (heat/warmth) to digest our food. Our body runs at roughly 98.6 degrees, and putting cold and raw food on top of this kills our fire, making it hard to digest our food. When we do this repeatedly, we begin to weaken our digestive system, which can result in a variety of symptoms, some of which are similar to those we can experience after eating processed foods. Done long enough and we even weaken our ability to absorb and use any of the nutrients from the food! In the beginning of this process, if you really want to reverse the effects of “poor eating,” start thinking stir fries, steamed veggies, soups, stews, chilis, and frittatas instead of smoothies, juices, salads, and iced drinks. It is important to note that once you start to correct your digestion, you may not have to completely eliminate these things forever, you may be able to to have them in moderation again, if you put the work in now. Trust me, it’s worth it; one of the biggest and most significant symptoms of this kind of imbalance is excess weight gain in the abdomen, so if pure health isn’t reason enough, that should be! 3: Eat regularly and mindfully. Remember that eating well is being kind to your body. It took me a long time to realize that the snacking and “cheat” foods were doing damage to more than just to my physical body--they were sending a strong mental/emotional message that it is okay not to take care of myself; it sends a message loud and clear of unworthiness. Yikes! But, really though, it does. Think about what you want to eat each day, maybe even plan it out each week, and make conscious decisions to stick with it. If you “cheat” or eat something that isn’t as good for you, try not to beat yourself up, because indeed, you are human. Mental energy around what we are eating can often be just as damaging or nourishing as the actual food we are eating. My final point for this tip is to try to eat in a relaxed environment, not in between running from thing to thing, or in front of the TV. Offer a blessing of gratitude towards your food before you eat and then proceed to eat slowly, and with awareness and thankfulness. Eating healthfully does not have to be super hard! It can be as easy as bringing your diet “back to the basics.” When you consider these three easy tips when deciding what you want to eat, choices will narrow because you will organically (pun intended) be pointed in the direction of food that is good for you. Last but not least, if you are having severe dietary issues/complaints/ailments, it is most beneficial to seek the help of a healthcare provider. Most acupuncturists incorporate diet into their treatment protocol, so if this is a concern for you, please speak up at your appointments, either with me or with your own acupuncturist. I will either work with you, or refer you to a professional specifically focused on diet and nutrition if I see fit.